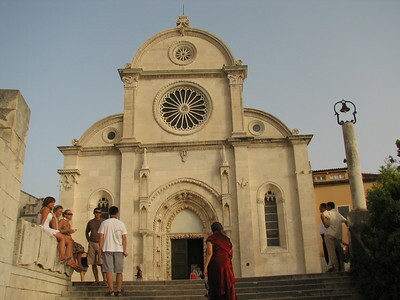 The Cathedral of Saint James in Sibenik is a Gothic-Renaissance construction built entirely from stone. It was built in three phases, by three architects, between 1431 and 1535. Its style started out as Venetian Gothic, but was turned to Renaissance by the two latter architects (Georgius Mathei Dalmaticus and Niccolá di Giovanni Fiorentino). These were also responsible for the characteristic sculptures. Slabs of stone from the island of Brac were used, even for the dome where stone wedges held the tiles in place. The cathedral suffered damage during both World War II and the fighting in 1991. The reconstructions that have been carried out since have been true to the original model and techniques. On a late Saturday afternoon I went by bus from Split to Sibenik, about 80 kms to the north. The public bus took us on a winding road along the coast line, passing several marinas. For me this was the first view of the non-touristy Croatia. It has a general Mediterranean feel about it, it could be anywhere between Spain and Greece. At the outskirts of Sibenik we hit upon a traffic jam caused by horning and flag waving car drivers. At first I thought that people were celebrating because Croatia had won an important football match. But it turned out to be a loud and patriotic wedding - not the last I would see that Saturday. 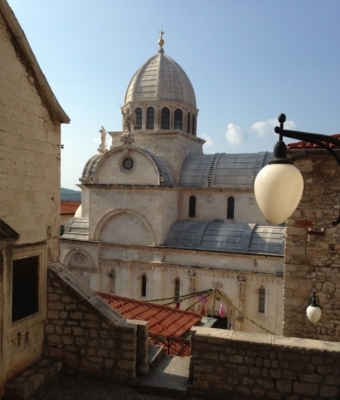 The cathedral of Sibenik is located about 10 minutes on foot from the bus station, and can be seen from afar. You have to get up close to get the real "Wow! "-feeling though. All those fine little sculptures around the gates, facade and apse! 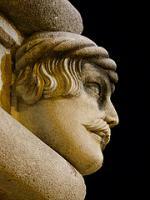 No less than 74 small sculptured heads that represent eminent Sibenik citizens are the highlight of the exterior. The interior of the cathedral is much darker and more sober. I didn't get the chance to explore the church well on the inside, because that would have meant that I had to push another bridal couple to the side. The cathedral of course is a prime wedding location: another couple and their guests were already waiting at the plaza next door for the next 'shift'. So I had to retreat again, and take the bus back to Split. Of all the cities that I visited along the Croatian coast, I think Šibenik is the one that won me over the most. It manages to mix the big city bustle of Split and Zadar with the quaint back alley picturesqueness of Poreč and Trogir, but retains a feeling of authenticity that can be lacking in the centres of those other cities. The World Heritage Site is just the Cathedral, which sits rather pleasantly at the northern end of the City centre between the idyllic waterfront and the surprisingly steep stepped walkways in land. In fact these streets of steps weren't initially obvious to us when we walked into town following our map, and we quite quickly realised that our daughter (and buggy) was going to need to be carried quite a lot if we were going to reach our destination. It did however give us a great first sight of the cathedral as we arrived a few streets over, looking down on its roof. The cathedral is very pleasant and seems to reflect local building techniques and styles, though my visit to the interior was rather brief and hasn't left a particularly lasting impression. However, late night and early morning strolls around the labyrinth of streets and squares nearby accompanied by the sound of ringing bells is one of my fondest memories of my whole trip. The real charm of Šibenik though was the remainder of the city centre. Trying to plot our way around without encountering steps became a rather enjoyable challenge, aided by the maps posted around town with appropriate colour coded routes. Though even without steps there are quite a few altitude changes. Mixed in with this was, what felt to us, a more functioning city, not one that was only there to service tourists. It helped that we hit a rich stream of lovely restaurants and cafes. I will give very strong recommendations to Bazza with a local craft beer menu to accompany the excellent salads (honestly the best I have ever had), and the fine coffee, friendly welcome and toys for toddlers offered up at She Bio-Bistro on a small square back from the seafront. All in all Šibenik provided the most rewarding stay of all the cities I've visited in Croatia. The Cathedral is a pleasant reason to visit this very charming and still liveable city. I visited this WHS in April 2014. Since it is quite close to several other WHS in Croatia and usually visited by tour groups on day trips, I decided to spend the night there. It turned out to be a wise choice as the narrow uphill streets or stairs and the old city centre were empty at sunset or at night or even early morning. This meant that I had the cathedral all to myself and I tried to discover different vantage points from where to take good pictures and appreciate this stone cathedral. The best views in my opinion are the following: 1) from the Ana Fortress or cemetery, 2) from beneath the few stairs immediately in front of the main facade, or else 3) all the way up the stairs to the left of the town hall. The main interesting peculiarity of this cathedral, apart from it being built entirely from stone, is that the apses and facades are adorned by common citizens' faces instead of saints or gargoyles. The highlight of my visit was the intricately carved baptistry at the back of the cathedral. It is in immaculate condition and the natural lighting on the baptismal font with angels was really something I'll never forget. 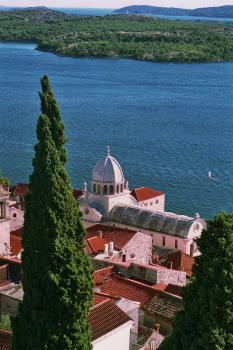 Sibenik is very pretty town in a scenic location on the Adriatic Sea. It features a picturesque Old Town, with the main attraction being the Sv. Jakov (St. James) Cathedral. The cathedral is built in a Venetian Renaissance style and is quite impressive, even though it is surrounded by buildings and can't really be admired from afar. The interior is also interesting and well-preserved, especially the baptistry. All in all, it is a nice attraction in a nice city, nothing very special, but certainly worth an excursion. The drive or bus ride from Split or Zadar along Croatia's stunningly beautiful coastline is a big part of the enjoyment. There are a lot of cathedrals on the WH list, plenty of them are larger in size or have a more magnificent interior decoration or are of greater historical significance. But the Cathedral in Sibenik has its own special charm: the location close to the shore, the bright white of the facade, and the carved stone portraits mentioned by Els. They depict citizen of Sibenik and not - as usual - saints or demonic creatures. But the special feature of the cathedral is the construction technique. It is entirely built of stone, no other material was used. The barrel vault and the cupola were constructed of self-supporting stone slabs. No mortar or other binding material was used. We visited Sibenik and the nearby Krka National Park as a daytrip from Trogir. We reached Sibenik in the afternoon and amazingly there were only a few tourists. That was a pleasant surprise compared with the crowds in Dubrovnik, Split and Trogir. We also strolled through the almost deserted old town and walked upstairs to the Ana fortress. From there you have a wonderful view to the cathedral and the bay (photo). It's a required field trip for all grade four studends in primary school. I went there when I was a fourth grader and later each time my mom thaught grade four (if she didn't take them to Plitvice which is an alternate trip) Either way I've seen this magnificent monument so many times and each time was as if I'm looking at it for the first time. Gates depicting Lions: The doors of the Saint-James' Cathedral in Sibenik are flanked by Venetian Lions. Damaged in War since WWII: "The dome of the church was heavily damaged by the JNA-supported Serb forces during the sheling of Sibenik in September 1991" (Wiki). Fusion: "The Cathedral of St James is the fruitful outcome of considerable interchanges of influences between the three culturally different regions of Northern Italy, Dalmatia, and Tuscany"